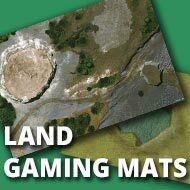 Here you will find all our land gaming mats, which can be uses with many of your favourite tabletop miniature wargames, such as Necromunda, Mordheim, Warmachine, Dust Tactics or Wings Of War. These tabletop miniature wargames playmats are made from high quality textured slip-resistant PVC, and are printed here in our factory. We have a number of different sizes of gaming mats available, to suit a wide range of sizes of playing surface, from 3x3 feet (36x36 inches), all the way to 6x4 feet (72x48 inches).